So much yarn, so little time. : Happy Birthday to me - yesterday! I'd had my pressie from Mr Nifty a while ago, the GPS so we could start geocaching. This card was from my oldest - isn't it perfect? 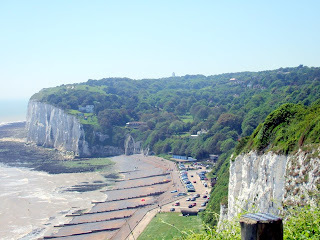 We drove to St Margaret's at Cliffe , near Dover. to find two geocaches. 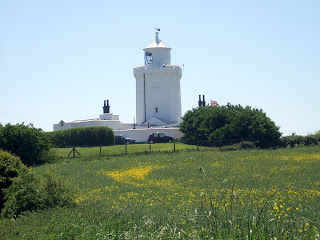 The first was near the lighthouse and is in memory of Yves Rossy who was the first person to fly solo across the Channel using a single jet-propelled wing - he landed right here! We ate our picnic looking out to sea - it was too misty to see France, you need a clear day for that. This is the view looking back - the lighthouse is midway on the horizon. 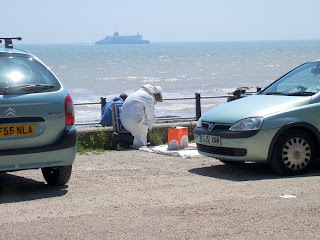 We then walked along the cliff and down to the sea briefly - saw a beekeeper colecting a swarm that was setting up home in the car park. I could have done with his protective gear last week! Up again (149 steps!) to the next section of cliff to the War Memorial (visible on skyline in pic above) and on to the next cache. 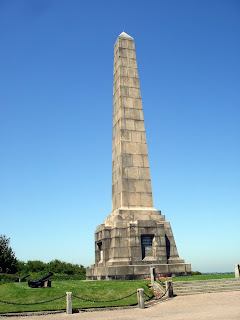 The Memorial recognises the Dover Patrol's protection of the Channel during WW1. There is an identical memorial on the French Coast, and one in New York Harbour to commemorate the work of the US Navy in protecting the Channel. Amazing what Geocaching can teach me! A belated happy birthday from me too. looks like you had a lovely day. I'm glad you had great weather on your birthday! 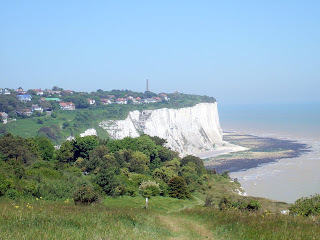 I can't get over how white the cliffs are..Your pictures are so beautiful...thanks for sharing! Massive happy birthday to you! Have to admit, your pics made me a teensy bit jealous of your geocaching, beautiful-photo-taking lifestyle! Hope all those bday wishes come true! I've left you some love on my blog. I hope it brightens your day! What a wonderful birthday! Beautiful pictures, too. BTW, I've passed along the "One Lovely Blog" award to you - my post goes up at 6am Pacific time and you can read about it if you're not familiar with it. Happy Birthday Nifty. What a lovely day you had. Happy Belated Birthday Heather! It looks like you had a beautiful in a very beautiful place! i've been to those cliffs....it's been since '85. should really get back to the uk for a visit!